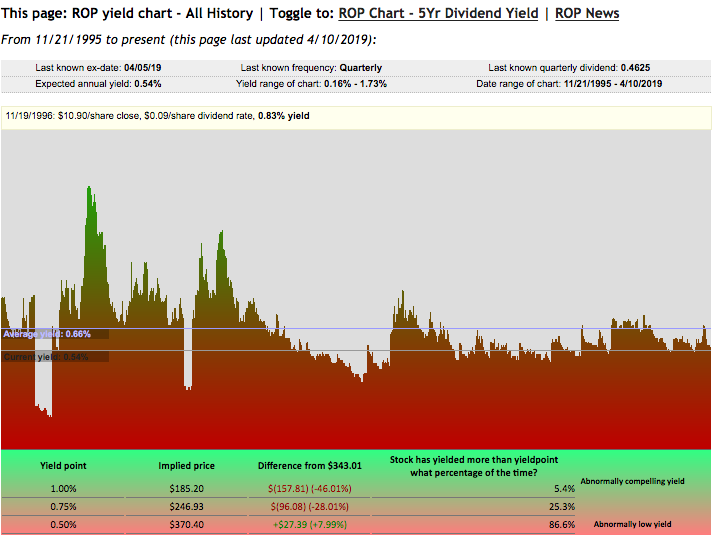 Roper Technologies is a dividend aristocrat currently trading near 52-week highs. The yield is small and does not make up for the above-average levels shares are currently trading at. Although the company continues to grow and would make for a good long-term holding, at this time, the valuation does not make sense. Roper Technologies (ROP) is a $5 billion in revenue company based in Sarasota Florida. While it has a $35 billion market cap, it seems to fly under the radar of most investors. The company operates in primarily four segments which are classified as "Technology & Software", "Medical & Scientific Imaging", "Industrial Technology", and Energy Systems & Controls". The company has steadily grown earnings and become a dividend aristocrat over time as it has consistently delivered. 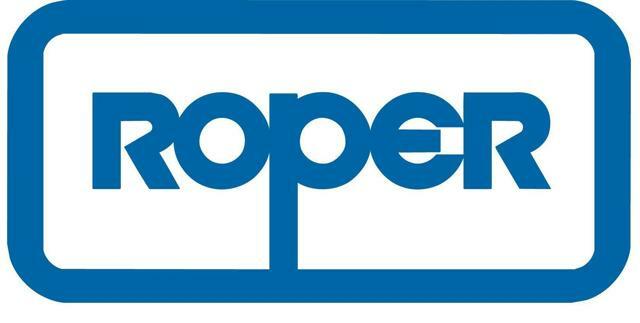 However, there is always a fair price to pay for any well-run company, and currently, Roper is trading at a premium valuation. As a possible investment for my long-term portfolio, I review what may be a fair price to pay for shares. Roper continues to benefit from growing demand for a broad range of technology applications and solutions that the company happens to offer. While many of the companies Roper operates through are not well known, they collectively touch the lives of many. The company offers products for medical screenings, lawyers, SaaS, college campuses, and more. In the most recent quarter, Roper beat on the top and bottom lines. The company saw double-digit revenue growth for the quarter helped by 9% organic growth. The company also continued to expand margins and grew cash flow by 27% for the quarter. As we can see below, the company is operating exceptionally well. Alongside strong revenue and cash flow growth, the company saw earnings rise 19% for the quarter. These results were all a record for the company and continue to help propel the stock higher. The strength came from strong revenue growth in almost every operating division. The company continues to find ways to grow margins as well in a time when many are seeing margin pressure. These are all positives that warrant a premium valuation. For the full year, we see the company do just as well. There was a total revenue growth of 11%, most of which was organic. Additionally, the company grew its gross margins and benefited from a lower tax rate. All of this helped the company experience an unbelievable earnings growth rate of 25%. As the company accelerates its operating results, it has improved its financial position. Currently, the company remains fairly levered. While I would like to see the cash position improve, I believe the company does not have excess debt and should the economic conditions it operates in weaken, the company will be able to maintain its position just fine. Going forward, the company has guided for diluted earnings per share of $12.00-12.40, excluding possible acquisitions. This would represent earnings growth of around 4% at the mid point of the guidance. Part of this includes a negative $0.25 impact from the divestiture of a business. This is not as thrilling as the growth the company recently posted. With this, we see if the valuation is representative of the lower growth. Normally, we would compare the valuation of Roper to peers. However, due to its unique portfolio of companies, there is not a real direct comparison. So, instead, we will look to see how the shares trade versus their 5-year average valuation. From what we can see, the shares currently trade at a premium to their own historical average for P/E, P/CF, P/B, and forward P/E. Typically, the premium should be assigned if the company is expected to grow at a higher average rate. However, this is not the case as we saw with the guidance of low-single digit growth. In this case, I would look to add shares at a discount to their average valuation and not a premium. It is clear the shares are trading above where we would like to invest. If the shares were to return to their average forward P/E, the stock would trade around $290 per share. 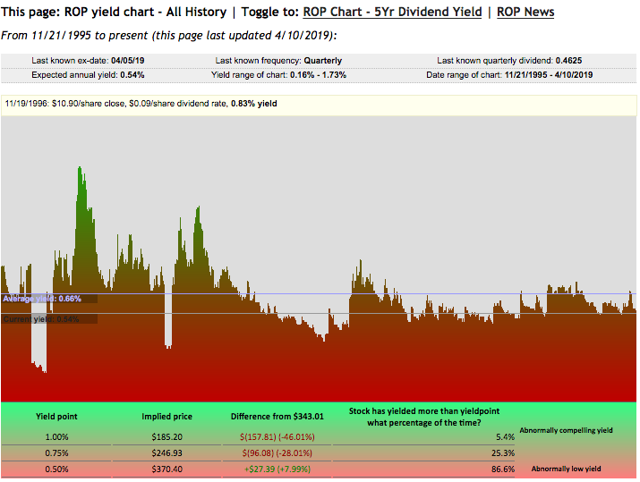 Next, we look at the historical yield to see if the shares offer a chance to buy while offering a higher than average dividend. The company has offered 25 years of dividend raises and, yet, it only has an average yield of 0.64%. However, at this time, the shares trade with a yield of 0.54% signaling the shares are once again trading at a premium compared to their own history. We would look for the chance to purchase shares at an above average yield which would be 0.75% or imply a price of $246.93. Though this is not really an attractive yield for me, it is above the average none the less. 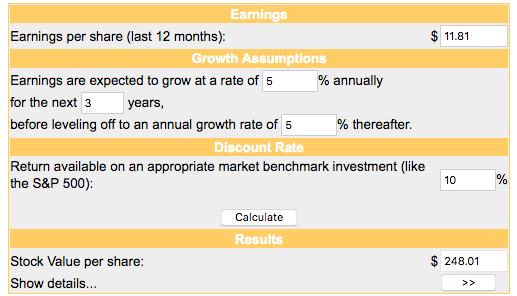 Lastly, taking a look at DCF, we can get an idea of what value shares may offer if any. With presumed earnings growth of 5% for the next 3 years and 5% thereafter, we see shares offer a DCF valuation of $248. This is close to the valuation we found with where shares would offer the above-average yield. Once again, it is clear the shares appear overvalued quite a bit. While Roper Technologies is certainly an admirable company, purchasing shares at an opportune time is important in ensuring healthy returns. At this time, it appears there may be more downside than upside risk. While it has been improving results consistently and has a strong balance sheet, any weakness in the economy could impact results and lead to the significant downside due to the premium shares currently trade at. 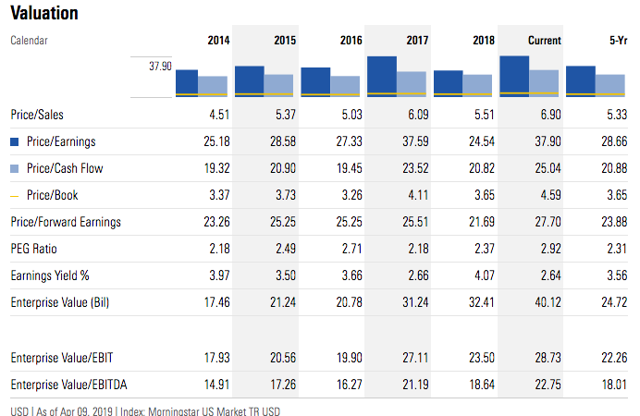 Should the shares trade down to a discount of 10% to their historical range or about $260, I would become interested in adding a position in the company to my portfolio. Until then, it appears there is no real upside left at these levels unless earnings increase significantly.